Kangana Ranaut's recent explosive interview has made her the buzzing topic in B-town. The diva had made several revelations regarding her relationship with Aditya Pancholi and how she was abused by him. She went on to say, "I'm a year younger than his daughter. I was a minor," and even added that she even seeked help from Aditya's wife Zarina Wahab. However, contrary to the reports, Zarina termed Kangana's claims as 'ridiculous'. During her recent interview with Pinkvilla, Zarina admitted that she is highly upset with Kangana's statement and that she never treated her like her daughter. "She was dating my husband (Aditya) for four-and-a-half-years so how can I say that she's like my daughter? Impossible!," Zarina was quoted as saying. The veteran actress further stated that Kangana didn't turn to her for help. "Yeh toh sawaal hi nahi hota hai yaar! Agar meri husband ko date kar rahi hai, toh mere paas kaise aayegi? Bolnewali ko bhi akkal honi chahiye! (There is no question of this happening. If she is dating my husband how can she come to me? People who talk like this should have some brains! )," Zarina said. She added, "I met Kangana a few times because my husband wanted me to take her to meet Sanjay Leela Bhansali so I took her there. First of all, I never discuss my problems with my own sisters so who is she (Kangana) to me that I will go and discuss with her that if he's not coming home I will be happy. What nonsense is she talking about?" 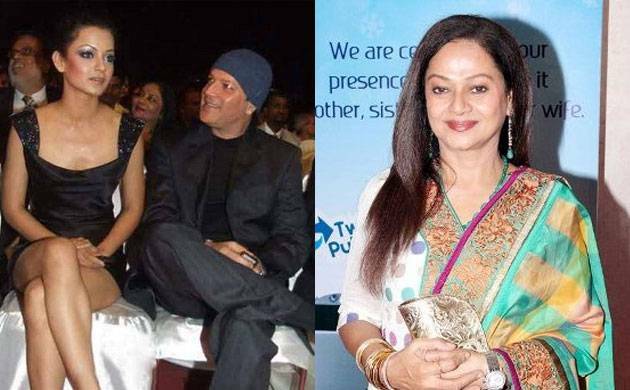 Earlier, Aditya Pancholi too had lashed out at the Queen actress for all the allegation against him and even cited her as a mad woman. "She is a mad girl, what to do, did you see the interview? Didn't you feel like some mad person was talking? Who talks like that? We have been in the industry for so long, nobody has ever spoken anything so evil about anyone. What should I say, she's a mad girl. If you throw stones in mud, it will only spoil your clothes," Aditya was quoted as saying.